Alexander the Great Beach Hotel is set right on the beach and offers plenty of opportunities to relax as well as options for keeping active. It’s perfect for both families and couples, with water sports, a wide range of restaurants, a gym, spa and lots more on offer. Enjoy the beautiful lawns fringed by palm trees, relax by the swimming pool or enjoy the whirlpool, jacuzzi and waterfall. The hotel offers a choice of well appointed rooms as well as cabanas, some with private pools, which are located in the hotel's gardens and are exclusively for adults.There is a choice of restaurants from a traditional Greek taverna to contemporary Japanese. The hotel offers a choice of swimming pools with a new infinity pool with waterfalls and whirlpools, the Serenity pool which is reserved for adults and an indoor heated pool with panoramic sea views. Those wanting to enjoy the ultimate relaxation can simply swim up to the bar and choose from champagnes, smoothies, wines, cocktails, and more. Alternatively, head to the spa and enjoy a range of relaxing or rejuvenating treatments. 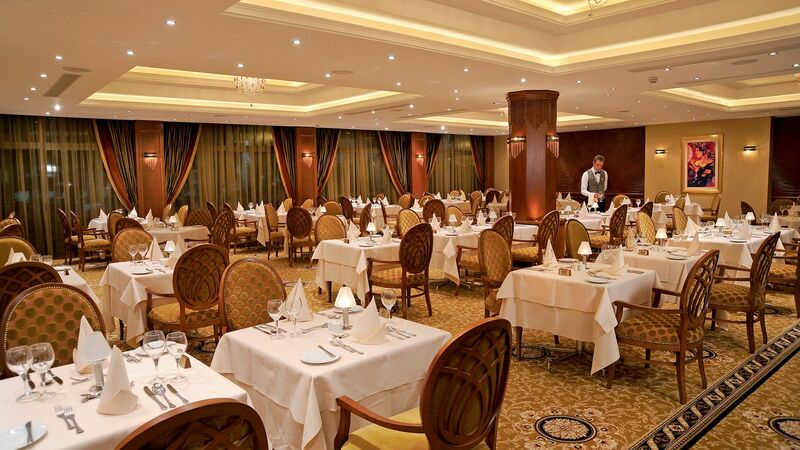 Enjoy a range of lunch and breakfast options at the international buffet in this elegant dining room. Live cooking stations are great for kids and adults. The dress code is smart casual and meals are included for full board plus and half board plus guests. Modern décor provides the perfect setting for delicious authentic Italian cuisine. The four course set menu is carefully curated by expert chefs as you dine over candlelight with soft music in the background. The dress code is smart casual, with long trousers and closed shoes required for men. Full board plus and half board plus guests can dine here once per week. 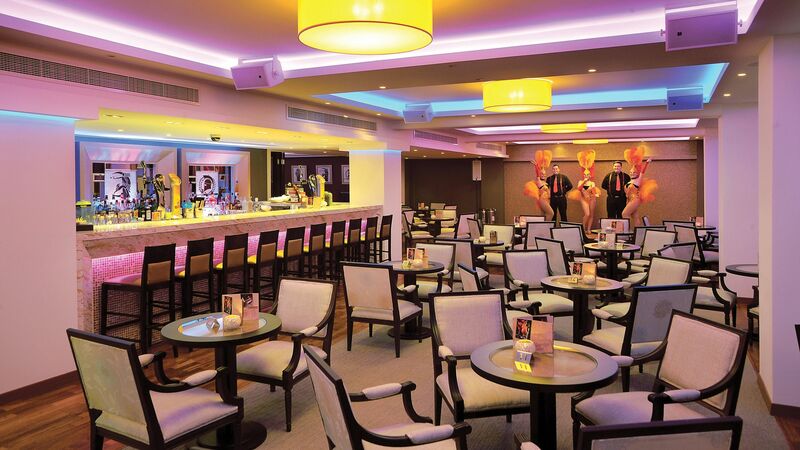 This chic bar is the perfect place to enjoy a relaxing drink, including cocktails, champagne, fine wines, beers, spirits, soft drinks and coffees. This as al fresco terrace offers the perfect place to relax with a drink or light bite. Snacks, ice creams, champagnes, wines, juices, coffees and more are served throughout the day. Built in the style of a traditional Greek tavern, this comfortable and rustic restaurant serves up a range of options. 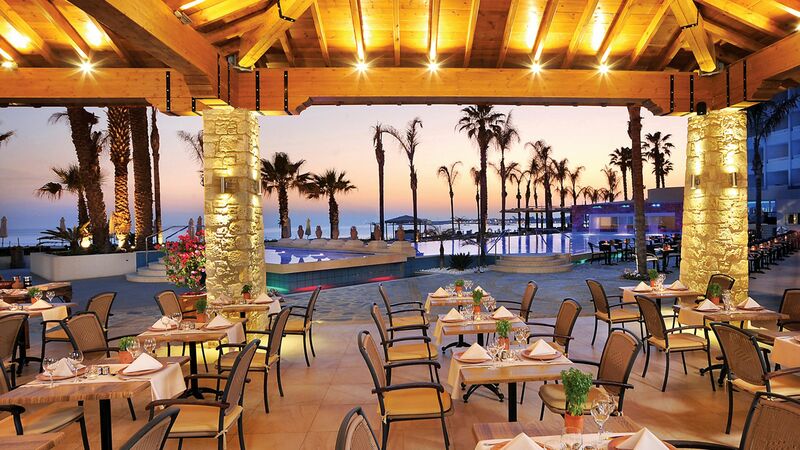 Take in the views over the sea as you try mezze platters and a range of traditional Cypriot and Greek flavours. Half board plus and full board plus guests can eat at the restaurant once per week. 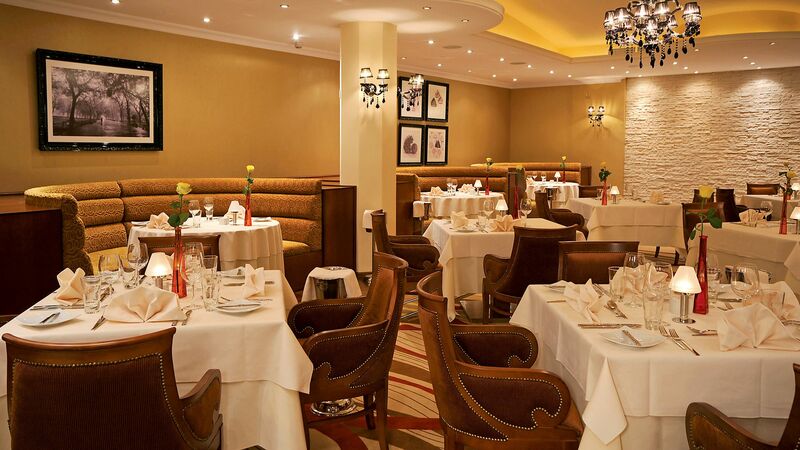 This richly decorated restaurant serves delicious international buffet dinners with a range of options on offer. Show cooking and themed buffet means there’s something different to enjoy every evening. The dress code is smart casual. Men are required to wear long trousers and closed shoes. Meals at the restaurant are included for half board plus and full board plus guests. 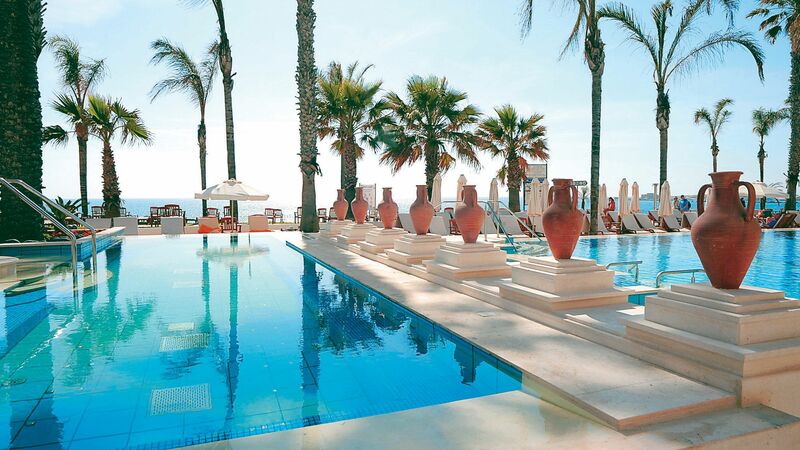 Swim up to the bar and enjoy a selection of refreshing drinks. Slush puppies, cocktails, juices, beers, smoothies and more are on the swim up bar’s menu. 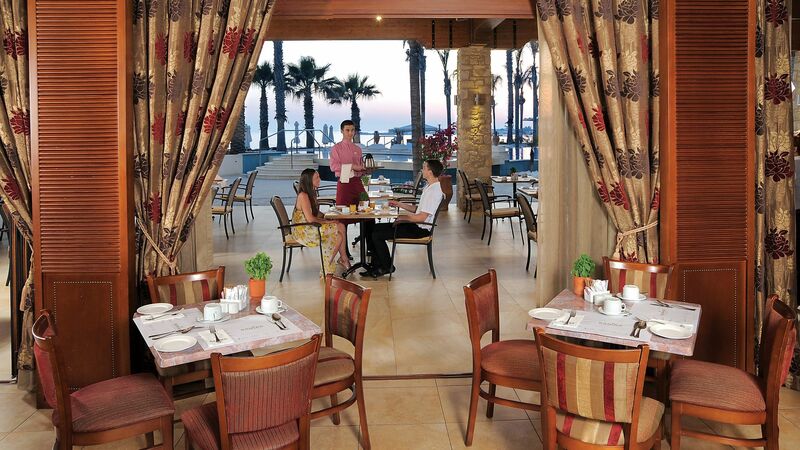 Dine al fresco on the terrace as you overlook the Mediterranean and choose from a large selection of Asian dishes. Options include Thai curries, sushi, teppanyaki and Chinese dishes. The dress code is smart casual and half board plus and full board plus guests can eat here once per week. There are four swimming pools to choose from. The infinity pool has a swim up bar, jets, whirlpools and waterfalls as well as views of the ocean. There is also a kids’ pool, spa pool and a heated indoor pool. The Alexander the Great Beach Hotel is located on the sands of a golden Blue Flag beach, perfect for both children and adults. Relax on the loungers or try some of the water sports, including sailing and scuba diving. 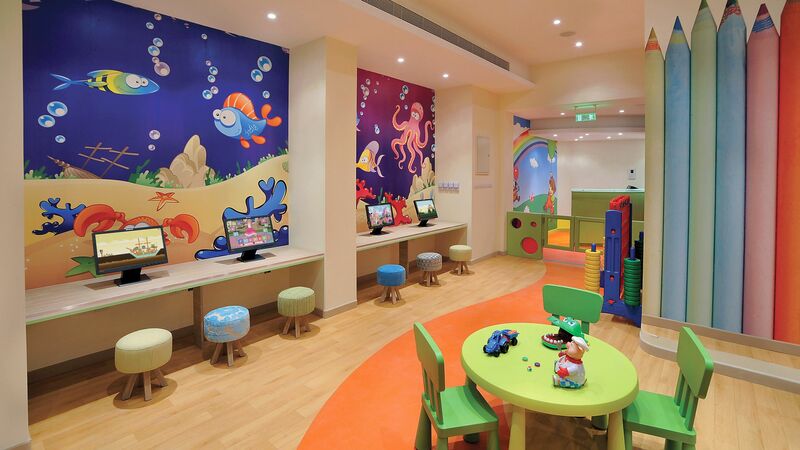 Internet stations, computer systems and kids’ entertainers will keep younger guests entertained all day. There is also a daily programme of events, including theme days, discos, mascots, shows and lots more. Kids can enjoy their very own disco every evening, with a chance to make new friends and dance off some excess energy before bed. Totally relax with a range of treatments from expert staff, including massages and facials. Choose from stress relief or rejuvenating options, or relax in the steam room or sauna. The Serenity Spa is only available to guests over 16 years. 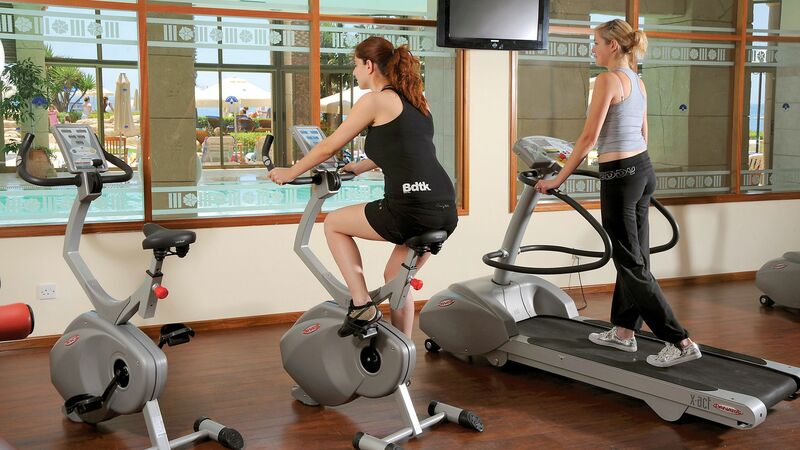 The hotel’s fully equipped gym is air conditioned and provides all the equipment you need to keep active on holiday. You can also choose from a range of exercise classes. The hotel’s gym is available to guests over 16 years. 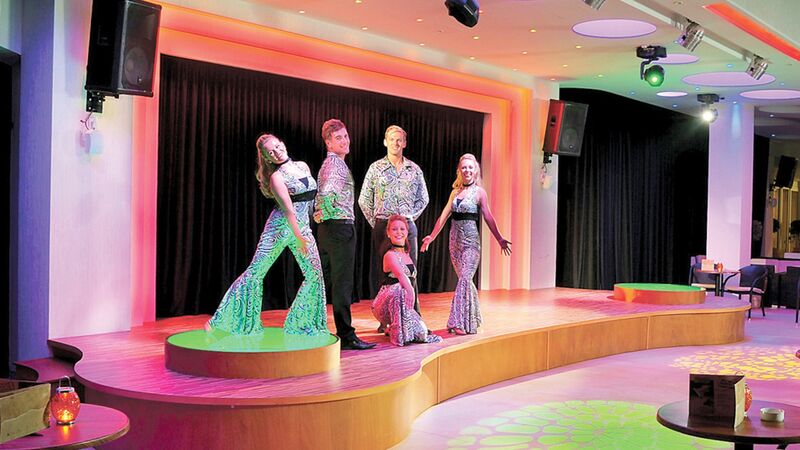 Musical shows with singing, dancing and acting are performed a few times per week. Adults will love the shows and there is also a bar serving a range of drinks. 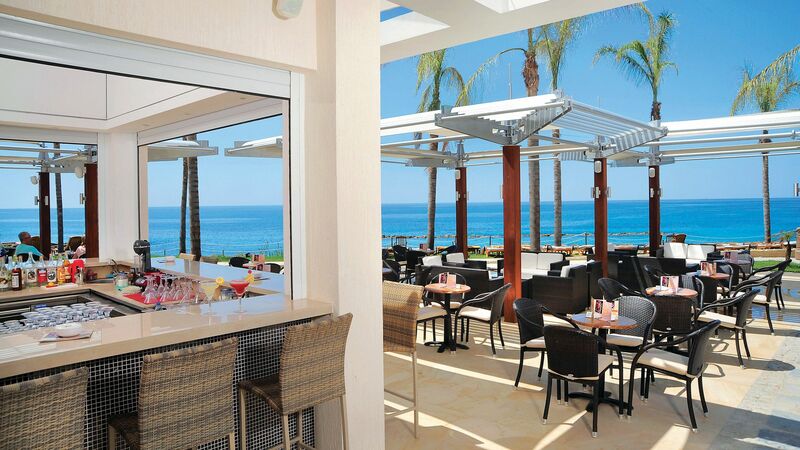 Located on the golden sands just minutes away from the centre of Paphos, the Alexander the Great Beach Hotel is the ideal place for those wanting to enjoy sun, sand and sea. The hotel is just minutes away from the hotel, and some of the area’s top historic sights. Visit Paphos Archaeological Park or Tombs of the Kings to step back into the island’s ancient past. 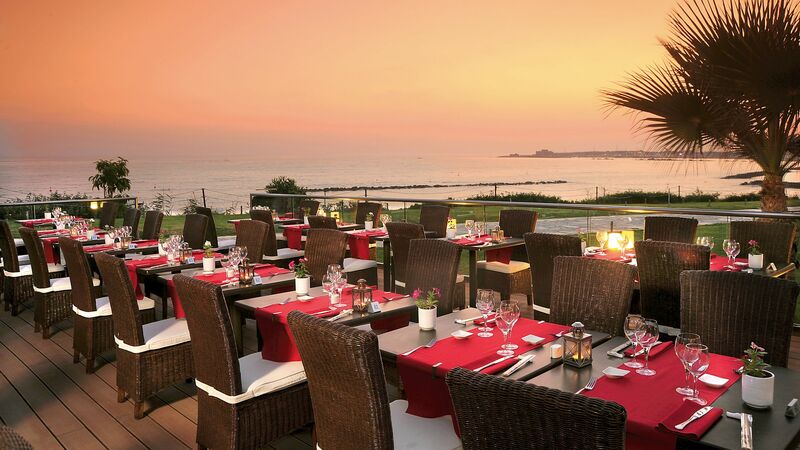 Paphos has something for everyone, with its modern harbour area full of vibrant activity, shops, bars and restaurants. The old town has cobbled streets and pretty cafés while there are beautiful stretches of Blue Flag beaches, perfect for families. 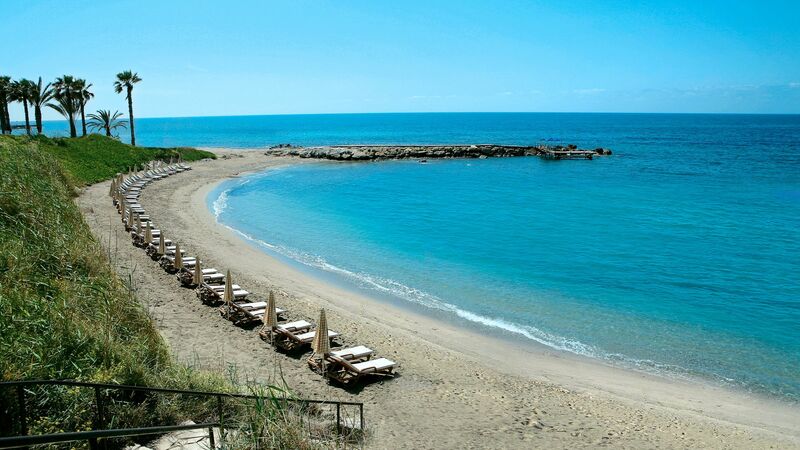 Alexander the Great Beach Hotel is a 20 minute drive from Paphos Airport. Deluxe Inland View rooms combine style with comfort, as well as being slightly more spacious than the other deluxe rooms. A full height French balcony gives the room plenty of light and the bathroom has a picture window looking out into the bedroom. There is also a small seating area for guests to relax. The Deluxe Side Sea View rooms are a popular choice with guests, offering a comfortable room with a furnished balcony for guests to relax. The bathroom is spacious and has exclusive toiletries as well as a large rain shower over the bathtub. The Deluxe Front Sea View rooms are a popular choice with guests, offering a comfortable room with a furnished balcony for beautiful panoramic views. The bathroom is spacious and has exclusive toiletries as well as a large rain shower over the bathtub. Superior Sea View rooms offer a little added comfort as they are larger in size as well as a having a seating area with sofa with spectacular views of the ocean, the medieval castle and Paphos old fishing harbour. The bathrooms are generous in size and have a rain shower and bathtub with a picture size window looking into the bedroom. A few Superior Sea View rooms do not have a balcony but are more spacious and enjoy a large window with magnificent sea views. These rooms have their very own private garden and are located in the hotel gardens with views of the sea and have a private terrace with sunbathing facilities. The Cabanas have a double bed and are for adults only, sleeping up to two people. The bathroom has the added luxury of a Jacuzzi® bathtub. Please note that this image is of the Superior Cabana Private Pool, this room does not have a private pool but the interior and layout will be similar. These rooms have their very own private pool and have a private terrace with sunbathing facilities. The Cabanas have a double bed and are for adults only, sleeping up to two people. The bathroom has the added luxury of a Jacuzzi® bathtub. The Two Bedroom Penthouse Suite is located on the third floor of the hotel with spectacular views of the sea, the Castle and the old fishing harbour of Paphos. The suite comprises of a large living area and two bedrooms each with a bathroom. The bathroom of the main bedroom features a walk-in shower. Save up to 15% discount on the hotel price for holidays between 01 - 08 May 2019. Each adult receives one free 30 minute back massage once during their stay for holidays between 01 October 2018 - 31 October 2019. Guests will receive a welcome drink on arrival, a selection of local delights in the room and free use of the sauna, gym, indoor heated pool, steam bath and tennis court. Fantastic hotel. Me and my partner have just got married here on the 17.04.19 and was the best day of our lives. The staff are so welcoming and great and very well mannered. Our family and friends also stayed with us at this hotel for 1 week and said it's one of the best holiday they have been on. I would reccomend anybody to have a wedding at the Alexander the great hotel. Big thankyou to our wedding coordinators:) Kayleigh and Jamie 2019. We have just returned from Paphos after a 3-generation family vacation. We were 10 persons: grandparents, parents and two grandchildren (a baby and a toddler). Staying in the hotel for 6 days, we had plenty of time to experience it and were most pleased with what we had. The lobby is spacious and there was no problem for our party to find room to relax. The rooms were very nice and very clean as was every other aspect in the hotel. The food was versatile and very tasty and the menu did not repeat itself. we had a full board stay so that we had plenty of experience. Last and not least was the service. Kind, attentive and professional is the least I can say. Every person, be it the maids, waiters, reception, you name it, were a pleasure to work with. we had a great time and we'll certainly return. The location is great but it is too crowded if you want some private time... At nights, the music is very loud & if you stay during wedding nights then you might forget you have come here to relax - we did it sleep for two nights of the four we booked due to loud music, disco & running floor noise despite our requesting the manager to lower the volume. The rooms do not have capacity to absorb sound as also the windows are single glazed... There can be long queues for breakfast & staff can huddle you to outside area despite your wanting to eat inside in a warm area. For a single night charge of ? ?165 (not is peak season), one would expect a much superior experience...alas what more can I say.